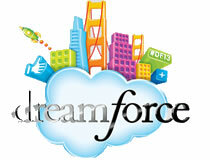 Salesforce.com Dreamforce Ready to Rock! Dreamforce is Ready to Rock! Dreamforce is the biggest CRM industry event and the CRM industry leader's annual articulation of industry change and company vision. This year promises a continuation of keynotes from both celebrity and equally impressive but lesser known business leaders, innovation and product roadmaps from Salesforce.com, over 1,000 expert-led user sessions, an expo of over 350 cloud CRM providers and an unmatched networking opportunity.